Are the Philadelphia Eagles in trouble after 1-3 start? The one team in the NFL that made more moves than any other in order to improve their squad on both sides of the football once the NFL lockout was over and done with was the Philadelphia Eagles. With a superstar quarterback leading the way in Michael Vick and an extremely talented roster of stars, the Eagles were considered to be instant Super Bowl title contenders and one of the best all-around team in the league. 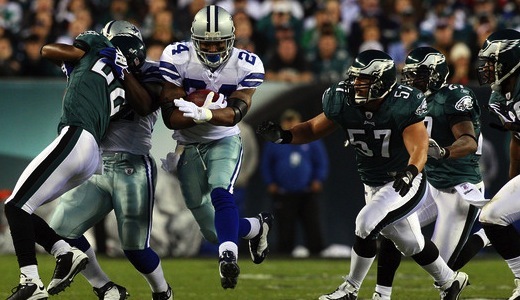 With all the added pressure of the Pro Bowl acquisitions like Nnamdi Asomugha, Dominique Rodgers-Cromartie, Vince Young and Ronnie Brown, the Eagles were put under the microscope right out of the gate when the NFL regular season began and they lived up to the hype by beating the St. Louis Rams in Week 1 in convincing fashion. The Rams were by no means stiff competition for the Eagles in Week 1, but they were thought to be a good test for this revamped squad. In Week 2, the Philadelphia Eagles were set to go head-to-head against Michael Vick’s former team in the Atlanta Falcons. This matchup was thought to be one of the Eagles toughest tests early in the season and they played well up until Vick went down with a concussion and had to sit out the fourth quarter. Even though Philly had the lead once Vick headed to the sidelines, the Eagles couldn’t hold on for the win as the Falcons pulled off the comeback and handed Philadelphia their first loss of the season. The loss to the Atlanta Falcons was thought to be due to the fact that Michael Vick couldn’t finish the game and this didn’t worry many people in Philly since the Pro Bowler would be ready to take the field in Week 3 against the division rival New York Giants. Even though Vick was able to get back onto the field in Week 3 against the Giants, the Eagles offense was ineffective with the quarterback getting even more banged up with an injured right hand to go along with recovering from the concussion in Week 2. Ultimately, the Philadelphia Eagles lost their second game of the season and first divisional game against a New York Giants team that was just as banged up if not more. This loss really started to turn heads in Philly as people started to question the coaching staff and the direction the team was going in, but things didn’t start to get really bad until the Eagles lost their third straight game against the San Francisco 49ers in front of their fans in Philadelphia. Now that the Philadelphia Eagles are 1-3 and seem to be losing the confidence of quarterback Michael Vick who says that he isn’t getting any calls from the refs on late hits, this team seems to be falling apart and could be on the verge of some drastic changes. Vick did have a good game against the 49ers with 496 total yards (416 passing, 75 rushing) and two passing touchdowns, but it wasn’t enough to hold off a resilient San Francisco squad, 24-23. From here on out, head coach Andy Reid could be on the hot seat in Philadelphia with Eagles fans calling for his head. Reid is without a doubt one of the best coaches in the NFL today, but if he can’t turn this team around the longtime head coach will almost certainly lose his job. « Could Terrell Owens return to the NFL sooner rather than later?